We have enjoyed using our wood stove in the new house. 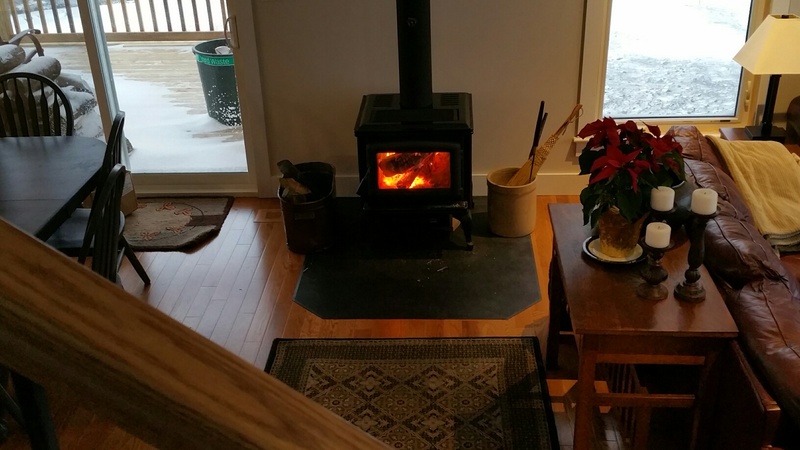 We do use the propane furnace sometimes but try to use the wood stove to heat the house as much as possible. Not only does it do a good job of keeping us warm and is enjoyable to look at but it is a form of renewable energy of which we have a great deal on the farm. The clearing of our house site created a lot of firewood and, in addition, nearly one-quarter of our 60 acres is covered in trees. We will be able to selectively cut out of those woods in perpetuity without reducing the forest cover. You could say that wood is one of the first “crops” that we have taken off the farm and one that we hope to take for many years to come. Our woodstove is a Pacific Energy, Super 27 model. It is a fairly small stove but does not have difficulty keeping the main living areas warm. In fact, because of the open plan and open stair case, the upstairs loft sometimes gets a little too warm. 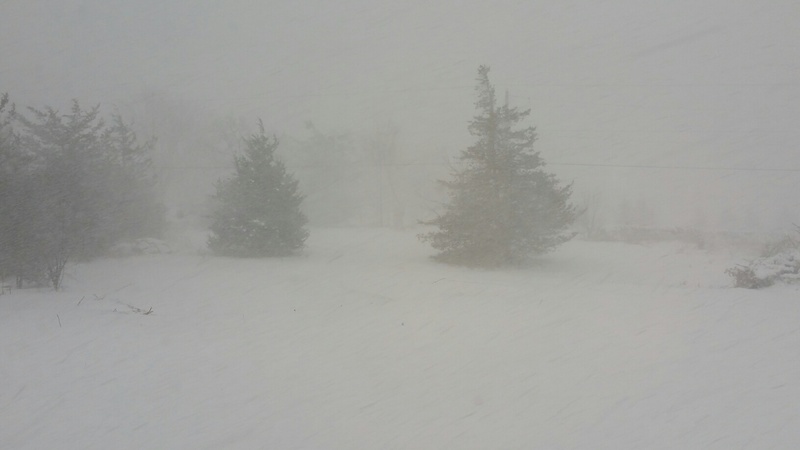 We keep the furnace fan on low and that distributes the heat throughout the house enough that all areas are warmed to about 20 degrees C.
Today was a cold, blustery day with a number of very heavy snow squalls coming in off the lake that caused near ‘white-out’ conditions. Despite the weather, I did not have to keep the wood stove full in order to keep the house warm enough. Even though we cut a lot of firewood this summer and fall, we thought that we would not be burning it this year because the wood generally needs over a year to properly dry. However, we learned that white ash, of which we have a great deal, does not need nearly as long to dry so we have been burning that. 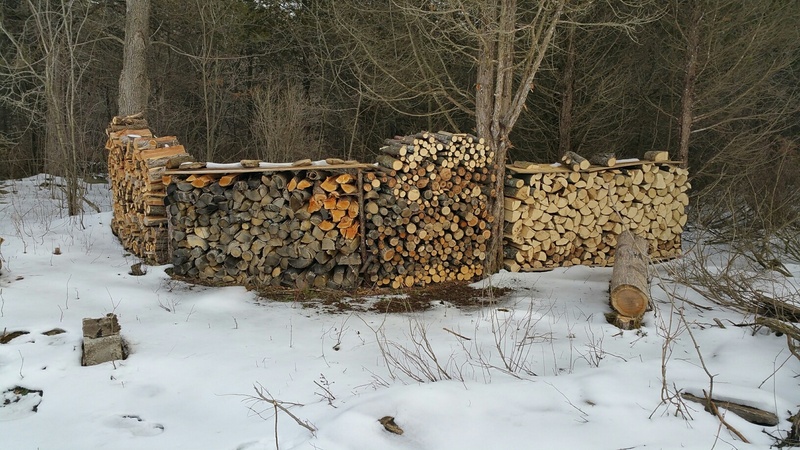 We are not sure whether that will last us or if we still will have to buy wood later in the winter. This is about 60% of the firewood that we cut this year. About half of our wood is white ash, which burns well less than 6 months after being cut. Most of the white ash in this area is dying because of the emerald ash borer so we are taking it more frequently than other types of wood. How lovely. This brings back memories of our wood stove when we lived in Ontario. I loved the bonus of being able to cook soup, baked beans and chili on the top. Loved our wood stove. Bill used to say that it warms you three times; when you cut it when you bring it inside and when it burns. Your house looks amazing. I’m sure you will be very happy once Andrew and Colleen and family arrives. I think that Bill was absolutely right, Margaret. In fact, I would add a fourth time that it warms you – when watching it burn! I can sit for quite a while just watching the flames. We haven’t done any cooking on it yet, Karen. It can take a large pot for warming but is designed for actually cooking only a smallish pot. But we should start using.